Implementing truly data-driven email marketing in your ecommerce business is no easy task…until now. Ed Hallen helps ecommerce companies easily implement data-driven email marketing that actually works through his platform, Klaviyo. He is a co-founder of Klaviyo, an ecommerce-focused email service provider that provides you with better email through data drive personalization and targeting. From powerful A/B testing to automatic analysis of conversions, Klaviyo helps you maximize the impact of your email on key metrics. He received his MBA from MIT, worked at Google, and led product management for Applied Predictive Technologies where he the guided product and technology vision for a team of 15 engineers and consultants. 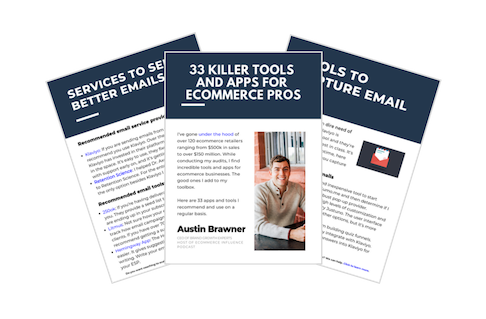 Ed has used those experiences to create one of the most robust email service providers for ecommerce businesses, one that we recommended to all of our clients. In today’s episode, Ed helps us understand all components in data-driven email marketing. How you can market like Amazon in a one to one way. Crafting your message to a customer from day 1 to day 365. 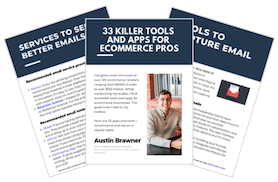 The 3 pillars of successful ecommerce email marketing. Which email campaigns you should start with and how to do it. Also, ratings and reviews on iTunes (hopefully 5-stars!) help us tremendously, we’re very grateful for them. We do read all of the reviews and we’ll answer your questions or comments on future episodes.